Home › Investing › How Much Does The Top 1% Make? How Much Does The Top 1% Make? A popular talking point on business news channels and in politics is the “top 1%” but what does a 1 percenter actually take home each year in income? Wage statistics show Americans report over $7 trillion dollars in earned income annually, which boils down to an average wage of $46,119. But what do you need to earn to put yourself in the top 1%, top 2%, top 5% or even top 10% of salary earners in the USA? How Much Income Puts You In The Top 1%? How Much Do You Have To Earn To Be In The Top 2%? What Income Is Required To Be In The Top 5% and Top 10%? How Many Wage Earners Make More Than $1,000,000? What Are The Ways To Make More Money? Before sharing the income needed to put you in the top 1% of all wage earners, here’s a little trivia on how much the top 200 wage earners bring in each year in the USA. Drumroll, and the amount is… a whopping $50,000,000+. That’s right, 202 Americans brought in over $50,000,000 in wages over the course of the year. And 979 Americans pocketed an astounding $20,000,000 or more. To put that in perspective, the top 979 wage earners in the USA according to recent tax filings pocketed at least 433x the salary of the average income earner over the course of year. Puts You In The Top 1%? You don’t need an 8-figure or even a 7-figure income to make it into the top 1% of earners, but you will still need to pull in at least 6-figures. To count yourself among the elite 1% of wage earners, you will need to pocket over $250,000 annually. So, the super-elite top 979 wage earners make 80x more than the top 1%! To Earn To Be In The Top 2%? Wage earners bringing in more than $195,000 can count themselves among the top 2% in the USA. When you compare what the top 2% make compared to what the median wage earner takes home, the differential is vast. 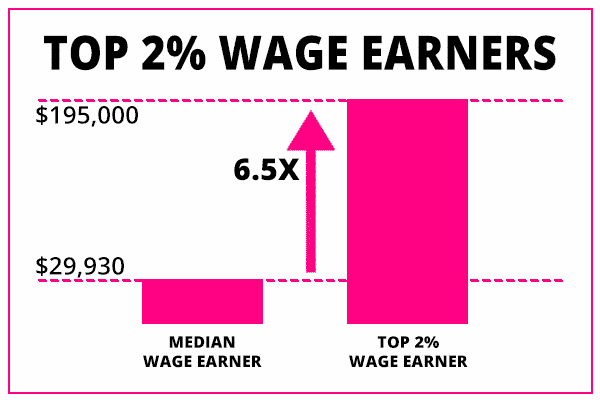 The median wage earner takes home $29,930 annually, so the top 2% make over 6x more. To Be In The Top 5% and Top 10%? To count yourself among the top 5% of wage earners in the USA, you need to bring in an annual salary of at least $130,000. Of the 160 million wage earners in the USA, the top 10% earn an annual salary of at least $90,000. >> You Might Also Like: How Much Should Be In My 401(k)? Comparatively few Americans earn over $1,000,000 in salary annually. In fact, if you are one of the 137,545 salary earners who makes more than $1 million each year, you can count yourself among the top 0.085% of taxpayers. If you are in that elite group it means when you walk down the street, approximately 999 people out of every 1,000 earn less than you do! As you can see, very few wage earners make the big bucks. But that doesn’t mean there aren’t ways to boost your adjusted gross income annually. One way to grow your wealth over the long term is to follow the advice of billionaire investors, such as Warren Buffett, who advocates investing on a consistent basis in the S&P 500. Very few professional investors, let alone casual investors, beat the market consistently but regular deposits into index funds that track the general market have been shown to perform better than most professional money managers. The reason for the outperformance is not always because money managers perform badly, though this is definitely one of the primary factors. The gorilla in the room when it comes to underperformance stems largely from high fees too, such as expense ratios, charged by mutual funds. One way to invest easily and automatically in index funds is through robo advisors, such as Betterment and Personal Capital, who handle all aspects of managing your portfolio. Some added benefits include tax loss harvesting to lower your tax bill and retirement calculators, financial goal setting tools, and mobile apps to track budgeting, spending, and net worth. Both will connect you to human advice too if you would like a little extra hand-holding, though the thresholds are higher than automated investing services. Another way to invest automatically is through the Acorns mobile app, which rounds up loose change from each transaction and invests the money automatically. >> Is Facebook Stock a Buy or Sell? >> What Is The Betterment Minimum?